My laptop is poorly again :( I'm having to use the OH's slow as a slow thing netbook and I hate it. I tried to post this mani from my phone yesterday but it was sulking so I'm late. Grr technology why you be a hater? 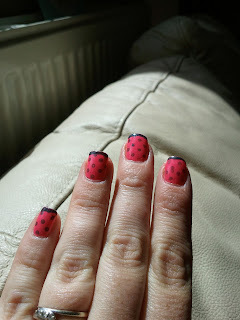 I think it's cute, what plate did you use for the polka dots? I want it! This is very cute . Looks like a lady bug .